iDid: Automatic Actions and Custom Places : iDid Inc.
With iDid: Auto-Actions, set up automatic actions for any place you visit, your drives, your meetings or for when you go to sleep/wake-up. Control phone settings, run other apps or turn on/off Belkin-WeMo appliances. As iDid keeps track of what you are doing – visiting a place, driving, in a flight, meeting and such, this feature enables you to configure automation actions for any of those events. For example, if you want to always silence your phone at church, enable Wi-Fi at home, enable Bluetooth when driving, launch “Pandora” at gym, change ringtone at work, etc., you can do all that. To use Automated Place-Actions, just select your current location marker, select the home icon and set up actions for that place. Actions will be immediately applied and applied whenever you visit that place in the future. When you leave the place, your Default Settings will be restored. For detailed instructions see “How to customize places?” section below. To use Automated Drive-Actions, select Settings and “Drive Actions”. These actions will be applied whenever you are driving. When you are done, just as in Place-Actions your Default Settings will be restored (or destination place-actions enforced if set up). To use Automated Meeting-Actions, select Settings and “Meeting Actions. These actions will be applied when you are in a meeting. When done, your settings will revert to whatever you were doing before. Use Settings->Sleep Actions to automate actions when you go to sleep/wake-up. iDid automatically detects your sleep pattern. You can edit the normal start and end sleep times. You can setup various actions such as a smart wake-up alarm that does not sound if you are already awake or gives you a minimum amount of sleep time regardless of when you went to bed before waking you up. 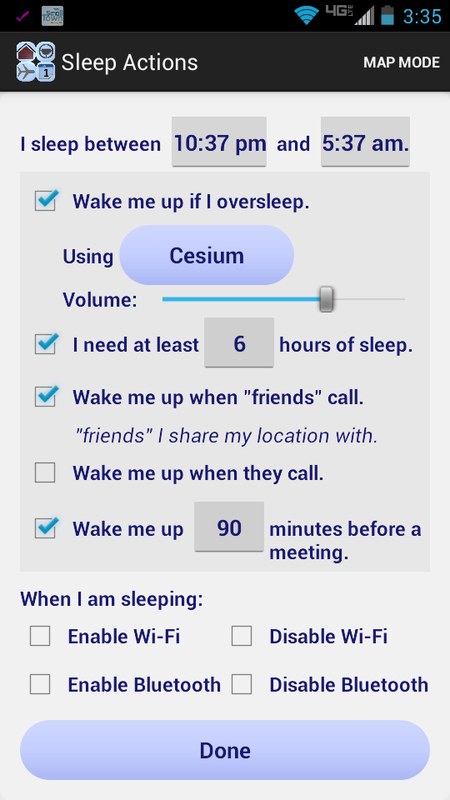 While you can set Sleep-Actions to silence your phone automatically when you are sleeping, you can still set it up to wake you up if important people call. You have two ways to specify that. You can either be woken up when people who are sharing their location with you call you or you can specifically choose people who can wake you up. You can set it up to wake you up an hour or so before any meeting. When you are sleeping you can set it up to silence the phone, or forward calls, turn Wi-Fi On/Off and control several other settings. You can turn on/off Belkin-WeMo devices that are in your home. 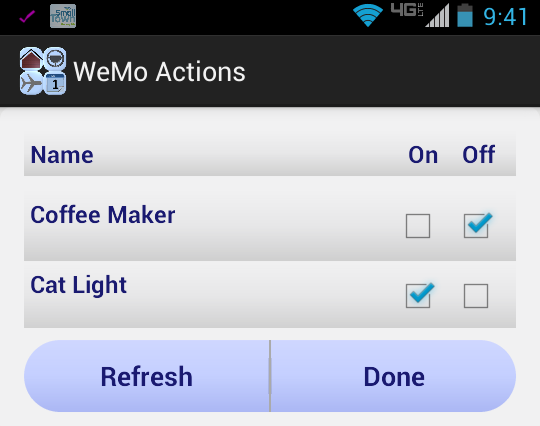 Hit the WeMo Setup button and it pulls a list of We-Mo devices in your house. Note that you must have Wi-Fi on to see WeMo devices on your phone. Hit Refresh if you don’t see all your devices. From the device list set devices that must be turned on or off when you go to sleep. Devices that are turned on when you go to sleep are automatically turned off when you wake-up. For example you may want to use this feature to control a night light that turns on after you have gone to sleep and turns off when you wake-up, or setup a coffee-maker to turn on as soon as you get up. iDid allows you to configure your phone settings or launch other apps based on the place you are currently in. For example, you can set it up to automatically turn Wi-Fi on when you are at “home” or “work” and turn it off everywhere else. Set up a custom ringtone at home and perhaps a more professional one at work! Launch your music app when you get to the gym or your hiking tracker when you get to the trail. Forward calls to your home phone when you are at home or work phone at work. You can configure these settings and actions for any place, not just work or home. For example, you may want to silence your phone at church. To customize places use Place Actions. Select “Map Mode” and click on your current location marker. It has your picture if your email contact has one. Select the home icon . The window that opens will display your location with address and a business name if applicable. Give the place a personal name and set up the options as you want. The default place radius of 300ft should work fine for most places. You can change it for large parks, libraries, lakes as you want. Hit Done. Actions are applied immediately and every time you visit the place in the future. To see a list of customized places, select Settings and List Place Actions. You can edit a place’s action after it has been created by hitting the view icon .